Will NH’s Fiscal System Get Better Looking Each Year? Up close everyone sees the wrinkles, greys and infirmities that come with age, but some things do, in fact, get better looking with age. Surprisingly, NH’s revenue structure may be one of them. For a lot of people New Hampshire’s fiscal system has been out of balance for a long time. I see it somewhat differently. The state was able to maintain a fiscal structure that was unlike any other in the country. Some hate it, some like, but one thing it absolutely most depends on is balance. Specifically, those identifying with the left of the political spectrum had to be satisfied with doing the things that state government has to do and only a limited amount of what it may want to do. While those on the right of the political spectrum had to be willing to occasionally adjust the tax price of services (adjust rates and fees etc. temporarily or in some cases permanently). Without a recognition of the need for balance from either side, the pressures from one side that were met with complete inelasticity from the other could cause the system to burst. If NH has lost some of that balance I hope it regains it quickly because while some may see our system as flawed, it has also been a big part of our successes. Looking toward the future, our current system is likely to suffer less from some of the demographically and economically induced changes in the growth in state-level revenues. I don’t know if we will be the envy of other states but we should consider the impacts of the changes before walking too far down the path of big changes. 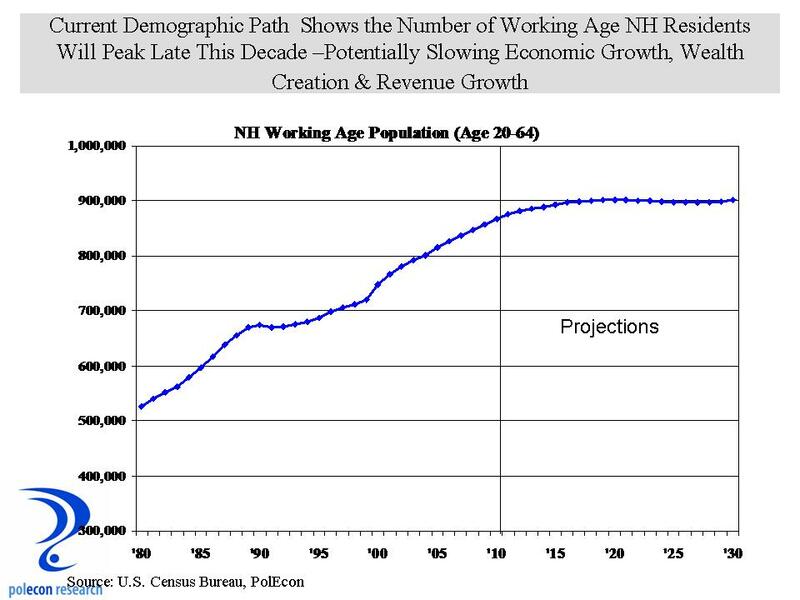 The biggest change is the fact that growth in the working age population is slowing and may continue to do so for decades (see below for NH). That, of course, implies slower growth in wage and salary income and states most reliant on income taxes will feel that pinch the most. On the flip side, with more older citizens, likely more income will be in the form of interest and dividends, a benefit for NH’s current system if interest and dividends tax revenue grows proportionately . NH’s business enterprise tax (BET) depends on wage and salary payments so that revenue source would be negatively affected but because of the way the BET interacts with the business profits tax(BPT), a decline in either source is cushioned by impacts to the other source. Moreover, as labor becomes more scare, the capital intensity of businesses should increase as businesses look to produce more with fewer people. While the BPT impacts will be mostly neutral, it is possible that a deepening of capital in the economy could increase in the relative profitability of businesses which would provide more lift to the BPT. As the age structure of the population changes to include more older residents, in the aggregate, less money will be spent on the types of things subject to general sales taxes and more on goods and services that are not taxed (health care being the most notable), thus sales tax revenue growth rates could slow. Combined with more sales occurring digitally via the internet and the generally increasing geographical separation of buyers from the location of sellers, this does not bode well for long-term growth in sales taxes. NH’s hybrid mix of taxes and fees collectively are likely to suffer less as a result of demographically induced changes in revenue . As the risk of impacts is spread over a greater number of sources, any negative impacts on one source will have less of an effect than if the state relied on either of the two major sources of most other state’s revenue, the income and general sales tax. For the most part, property taxes will also be relatively less affected by demographically induced changes. It may not look like it now, but with the kind of balance that characterized fiscal policy making in NH for decades, and with coming shifts in revenue growth resulting from demographic and economic changes, NH’s fiscal structure may well be better positioned to avoid the next (and inevitable) fiscal calamity to hit states. This entry was posted on November 9, 2012 at 12:40 pm and is filed under Demographics, Fiscal Policy, Tax Revenue. You can subscribe via RSS 2.0 feed to this post's comments.